Nearly all family offices, however, insist on investing directly. 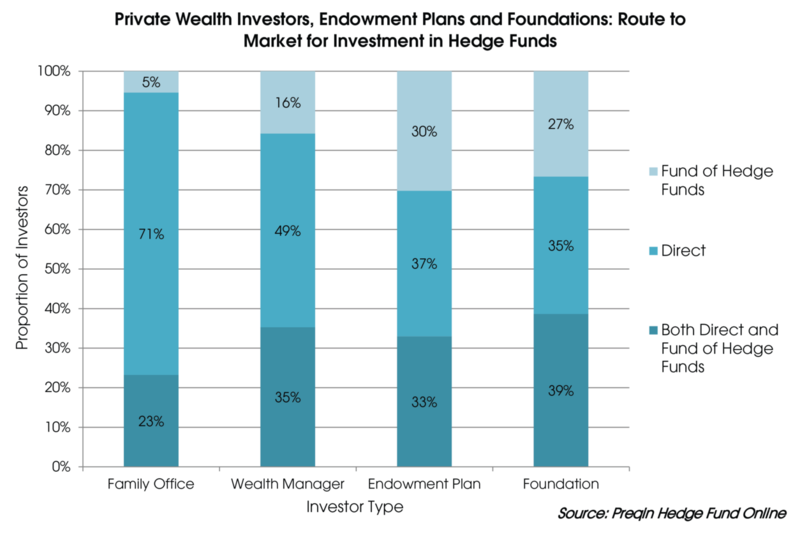 Endowments and foundations tend to use more funds-of-hedge funds than their family office counterparts, according to Preqin. The data firm found 30% of endowments and 27% of foundations invested through funds-of-funds, compared to just 5% of family offices. Family offices strongly preferred investing directly, with 71% targeting single-manager funds. Endowments and foundations choosing direct investments lingered at 37% and 35%, respectively. While long-short strategies were popular among all three investor types, a larger proportion of foundations (78%) invested in them. Just over a third of endowments and foundations also had exposures to credit strategies, while only 21% of private wealth managers showed preference. Some 85% of endowments and foundations said they preferred North American funds, compared to 60% of family offices. More than 90% of endowments and foundations were also likely to target global opportunities in their hedge fund allocations, significantly higher than 64% of private-wealth investors. Deutsche Bank’s recent alternatives survey echoed this sentiment, with 91% of investors increasing or maintaining their allocations to hedge funds in 2015. Some 41% said they planned to increase their exposures in 2016, while 48% said they intended to keep it at the same level. “The return dispersion seen in 2015 means that choosing the right manager and constructing the right portfolio is ever more critical,” said Anita Nemes, Deutsche Bank’s global head of capital introduction. Mercer also emphasized in January that nonprofit investors should scrutinize their hedge funds and lower than expected returns despite strong equity markets in the past seven years.